Wednesday Mostly sunny. Possible morning fog patches on the eastern slopes. Light winds becoming S/SW 15 to 25 km/h in the early afternoon then becoming light in the evening. Thursday Partly cloudy. The chance of fog in the early morning. 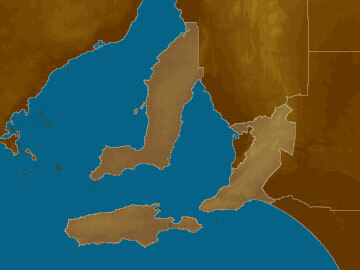 Slight chance of a shower about the southern Fleurieu Peninsula, most likely at night. Light winds becoming W 20 to 30 km/h in the morning. Friday Cloudy. Medium chance of showers, most likely in the morning. Winds W/SW 20 to 30 km/h turning S 15 to 20 km/h during the afternoon. Saturday Partly cloudy. Slight chance of a shower about the southern Fleurieu Peninsula. Light winds.